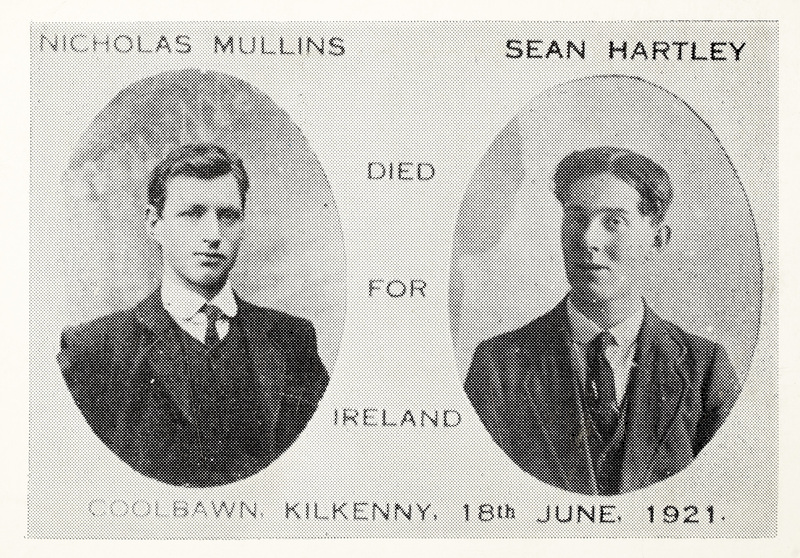 It always surprises me when I see photos of people who died for Ireland and I have no knowledge of their names or of the circumstances surrounding their deaths. Then with the magic of Flickr within a couple of hours we will know everything there is to know about Messrs Mullins and Hartley. [https://www.flickr.com/photos/beachcomberaustralia] Busy man today, well done. [https://www.flickr.com/photos/beachcomberaustralia] the monument is very well kept. stairnaheireann.net/tag/sean-hartley/ assaulted a Black and Tan convoy escorting explosives to a mine. Only one John Hartley in Kilkenny of the right age in 1911. Nicholas Mullins in Thomastown, "Carrier for Brewery". [https://www.flickr.com/photos/beachcomberaustralia] That Coolbawn ambush piece that I added to Irish Volunteer site is taken from Castlecomer Connections by Tom Lyng.